Today marks the first anniversary of the election of Japanese premier Shinzo Abe, and he has reason to celebrate - business confidence is higher than it has been since 2007. According to the Bank of Japan’s latest Tankan survey, the mood of Japan’s large corporates is up to plus-16 from plus-12, its highest level in six years. The turnaround in sentiment for the country’s hard-pressed smaller businesses, traditionally a great deal gloomier, is even greater: more now believe that the business climate is good than bad, the first such positive result since 1991. Yes, we did say 1991. Think of that and take comfort the next time you’re wrestling with your VAT returns. Japan’s struggle to escape 20 years of deflation and low growth is well known, of course. How much this outbreak of festive good cheer in the land of the rising sun has to do with the improving global sentiment and how much to do with Japan’s domestic political and economic reforms is a moot point. But PM Shinzo Abe – elected to power one year ago today on a pretty radical ticket – can certainly take some of the credit. 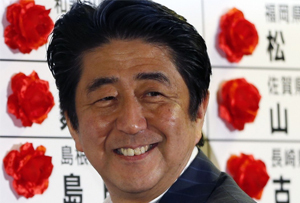 There are three legs to Abenomics – or Three Arrows, as he prefers to call them. The first is cheap money, what we in the west have come to know as quantitative easing. The second is government spending to stimulate growth, in the absence of private sector investment. On both of these first two scores – which you might call stabilising the patient – Abe can claim some progress. QE seems to be working best so far, there is inflation for the first time in ages – CPI is up to 0.3%. It’s a way off the 2% by 2015 target but it’s a start. Government spending is up too, but so is taxation to pay for it and with debt at 240% of GDP this is probably not sustainable. Which brings us to third and most difficult of the three arrows – longer term structural reforms. The major surgery for which the two other measures are simply preparation. Not much has happened on this score yet but in many ways it will be the most informative stage to observe, because Japan shares some of the same problems that afflict the UK and most of western Europe – an ageing population and sluggish productivity to name but two.